LeDuc & Dexter’s residential department is using piping products manufactured by Vanguard Piping Systems, Inc. for the first time on a project built by Centex Homes in Ignacio. The project, Sailhouse, consists of 49 single-family homes that range in size from 2,704 square feet to 3,548 square feet in size. LeDuc & Dexter is using Vanguard PEX piping, called Vanex and their water management system or manifold called MANABLOC. Jim Kempers, Residential Manager for LeDuc & Dexter sees the benefits that Vanguard offers to his company and especially to customers, “It’s quieter than copper piping when water runs through it. 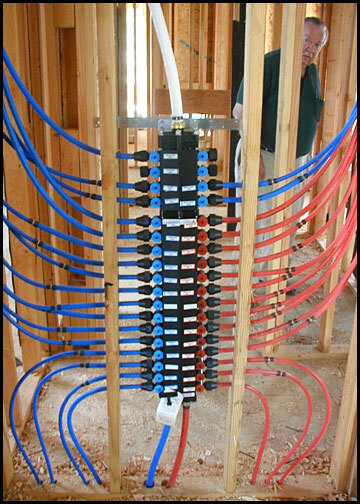 It’s easier to install because there are fewer fittings, it’s a home run system with fewer chances for leaks.” Because Vanex PEX is so flexible it requires far fewer directional fittings. Vanex is recommended for hot and cold water distribution and Hydronic heating systems. Vanex is color-coded with blue piping for cold water and red piping for hot water. Cross-linking is a permanent chemical change that occurs in Vanex PEX and gives it many advantages over other piping material. Aside from its flexibility, Vanex can stretch to accommodate the expansion of freezing water and then return to its original size when water thaws. Although Vanex is highly freeze-break resistant, no material is freeze-break proof. Vanex offers superior chemical and environmental stress crack resistance. Vanex tubing connected with the CRIMPSERT® fitting system is one of the fastest joining systems in the U.S. The MANABLOC manifold water distribution system consists of highly efficient water management technology. The MANABLOC system services each plumbing fixture with a dedicated water line from the central manifold plumbing control unit. The MANABLOC system equalizes pressure and makes it possible to use multiple fixtures simultaneously without dramatic temperature or pressure changes. The MANABLOC system uses less water and conserves more energy than other systems. Fixture repairs are easier to make because each fixture has its own shut-off valve. LeDuc & Dexter’s residential department is confident that these Vanguard plumbing products will be beneficial to their customers including future homeowners.